The Overlook portion of the trail is wheelchair accessible, 1/3 mile long and concrete paved. It forms a loop at the top of the hill overlooking the prairie and the bison enclosure. The Tallgrass trail is asphalt paved, 2 mile long trail that takes the user through the restored tallgrass prairie adjacent to the bison enclosure. There are some steep grades on this trail. The Max grade is listed as 6%, which is just above ABA grade requirements, is that max for the accessible portion or the whole thing? Travel 4 1/2 miles along the Neal Smith National Wildlife Refuge entry road from the Prairie City exit on Highway 163. After arrival at the Refuge Prairie Learning and Visitor Center, park and walk toward the Visitor Center. Before entering the building, turn right at the butterfly garden and follow the trail up and over the hill. The Neal Smith NWR is one of the largest prairie reconstructions in the state of Iowa. Over 3,500 acres have been reconstructed or restored to native tallgrass prairie and oak savanna. 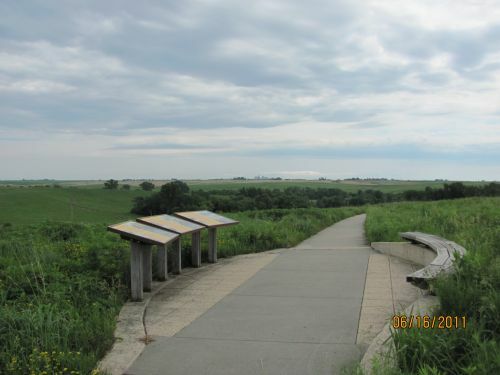 No where else in the state or in the country can visitors enjoy the views and interpretive experience of the Tallgrass Prairie as they can from this trail. The Overlook portion of the trail is wheelchair accessible, 1/3 mile long and concrete paved. It forms a loop at the top of the hill overlooking the prairie and the bison enclosure. It also provides additional interpretation about prairie reconstruction/restoration work at the refuge and the bison herd that is viewed from the trail. 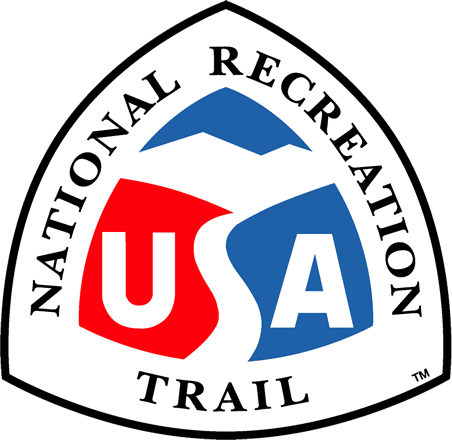 The Tallgrass trail is asphalt paved, 2 mile long trail that takes the user through the retored tallgrass prairie adjacent to the bison enclosure. There are some steep grades (give degree of the grades) on this trail. We allow the prairie grasses and plants to meet the edge of the trail so that in July and August when the grasses and flowering plants reach their greatest height, the visitor can experience the impact of the prairie vegetation that is described in early pioneer and emigrantjournals: plants reaching to horses bellies and children getting lost in fields.